Home / News / Politics / Slider / Press Release: Cyber Highjackers are Responsible for the Abudugate,Tijaneeya,Kotoko,Kukrudu,Man U Post-Fredick Tahiru,NPP Northern Regional Youth Organizer Hopeful. Press Release: Cyber Highjackers are Responsible for the Abudugate,Tijaneeya,Kotoko,Kukrudu,Man U Post-Fredick Tahiru,NPP Northern Regional Youth Organizer Hopeful. 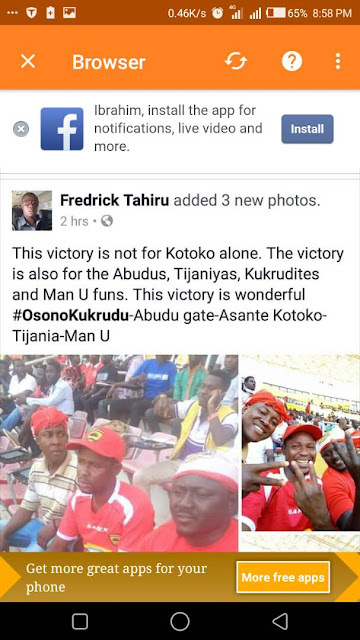 I woke up this morning to a post dedicating the victory of Kumasi Asante Kotoko in yesterday's FA encounter to the Abudus,Tijaneeya's,NPP and Man U.
I wish to state with force that,I am not responsible for the said post.I have nothing to gain nor loose in the feud between Abudus and Andanis.I have good friends from both sides.I have just won an ICT battle by recapturing my facebook Account from Hijackers who took control over my accounts since yesterday.I entreat the general public to condemn the activities of cyber criminals rather than mischievously attack the hard won reputation of victims of ICT criminals. Fredick Tahiru,NPP Northern Regional Communication Member and Regional Youth Organizer Hopeful. Call us on 0242818337/0208405999 for news coverage and any clarification about our published stories.